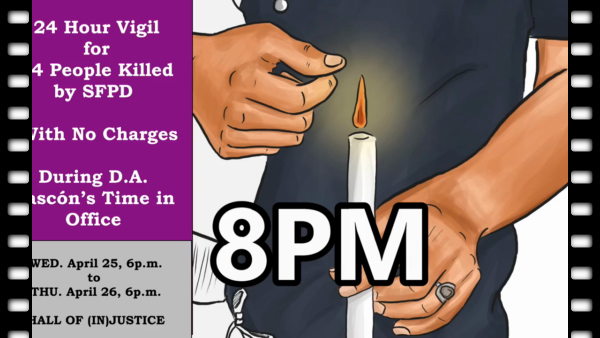 From April 25 to April 26, 2018, a 24-hour vigil was held outside District Attorney George Gascon's office for the 24 people killed by San Francisco police officers with 0 charges during his time in office. A month later, on May 24, D.A. Gascón declined to press charges — again — against the SFPD killers of Luis Góngora Pat and Mario Woods. A system that never gives justice invites us to found our own system of justice. §SF District Attorney Gascón's scorecard — a 100% police impunity rate!